Life, Doctor Who & Combom: A Town Called Mercy Giveaway! A Town Called Mercy Giveaway! Hey readers! Its that time again, well its a little late but I was having some technical problems, I won't bug you with that, but is has to do someone(pst its me) not saving before closing Microsoft Word, I lost my review of A Town Called Mercy, and I haven't had the time to work on it. Its a lovely little First Doctor Story, with a song that will be stuck in your head for days and days after watching it.... But over all its a....story I can at least say that. Its a fun one to watch and a western to match the theme. Now onto the question! For those who follow my twitter @KinkomanWho and guessed the DVD correctly gets an extra entry for this prize, see it pays to follow my twitter! So if you aren't go ahead now, I'll wait. ... Ok? good I may even have a few twitter exclusive giveaways! Also before the question, I have been asked to put my Is it a Classic? answer still up even though I'm not doing my reviews that way(I didn't see it working out in the long run). So is A Town Called Mercy a Classic? I'm going with yes! To me it was not an overly amazing story but is it a episode to show off, yes. Its funny in the right places, hints at The Doctor's past, and shows a little of his rage to pull us in. Both Amy and Rory did well in this episode(Amy keeping The Doctor grounded), and Rory, well being a little comic relief and over all helpful. 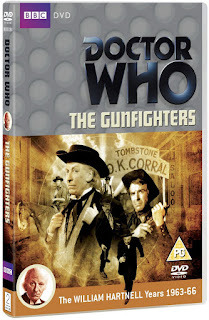 It had a good mix of one offs, and if you know little of Doctor Who, you can follow a "Classic" cyborg story. So show it off and make more Doctor Who fans!!! Now the question. Again the key to these are simple I ask a question about the episode that just aired, you answer, get it right, I round up all the names of the people who get it right in the first two days and draw one at random and the winner gets sent a copy of a classic episode.